Starting with Plane 2.72 a new navigation controller called the “L1 controller” was introduced. This controller produces much more accurate flight paths both for waypoints and loiter than the previous crosstrack and PID controller. Tuning the navigation controller usually involves adjusting one key parameter, called NAVL1_PERIOD. The default is 20, which results in reasonable turns for most R/C airframes. A smaller value for NAVL1_PERIOD will lead to more aggressive navigation (sharper corners). A larger value will lead to gentler navigation. You can additionally adjust the NAVL1_DAMPING and WP_RADIUS for further tuning. Make sure you have setup LIM_ROLL_CD to an appropriate value for the bank angle you are comfortable with your plane flying without stalling. For slow flying electric gliders a value of around 5000 (50 degrees) is a good start. For fast flying aerobatic planes you may wish to use a larger value, such as 6500 (65 degrees). Set NAVL1_PERIOD to the default value of 20, and NAVL1_DAMPING to the default value of 0.75. Set WP_RADIUS to the distance your plane would fly in 2 seconds at cruise speed. If you are tuning for maximum performance, once you have completed the tuning of NAVL1_PERIOD you can increment NAVL1_PERIOD by 1 and then modify NAVL1_DAMPING in steps of 0.05 to get the response you want. Do not decrease NAVL1_DAMPING too much - it is unlikely you will need a value below 0.6. To control whether Plane flies through a waypoint, then turns afterwards or turns before the waypoint so that it neatly lines up for the next leg of the mission you should adjust the waypoint radius via the WP_RADIUS parameter. If you want Plane to fly through the waypoint then set the WP_RADIUS to a small number, perhaps 10 meters. If you want Plane to turn before the waypoint so that it lines up with the next leg of the mission then set WP_RADIUS to a larger number. A good starting value is to set it equal to the turn radius your aircraft can easily achieve. This will normally be the same as your loiter radius WP_LOITER. Control Conference, Aug 2004. AIAA-2004-4900. The L1 length was calculated dynamically to enable a constant period for the tracking loop to be specified by the user and to enable the navigation loop gain to automatically adjust for changes in aircraft ground speed. Achieving a constant period for the guidance loop gives a consistent response across a range of airspeeds and enables the tuning parameter to be related to the time required to roll the aircraft and measure its response. The guidance gain was changed from a fixed value of 2 to be calculated based on the NAVL1_DAMPING value set by the user. This enabled additional damping to be specified to compensate for delays in the velocity measurement and aircraft roll response. A complementary filter fusing GPS velocities, airspeed and aircraft heading was used to estimate the ground speed vector. This enabled the accuracy of the GPs velocity to be taken advantage of, without the limitations imposed by its inherent latency. 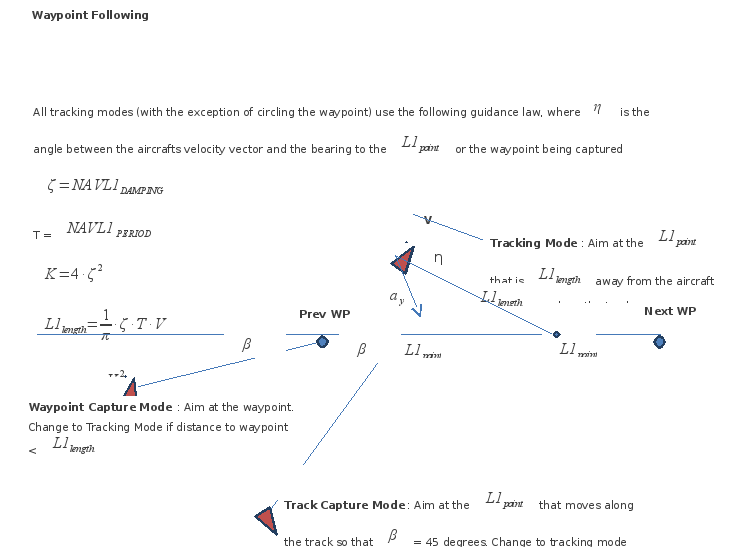 The track capture algorithm was modified to enable explicit control over the track capture angle. 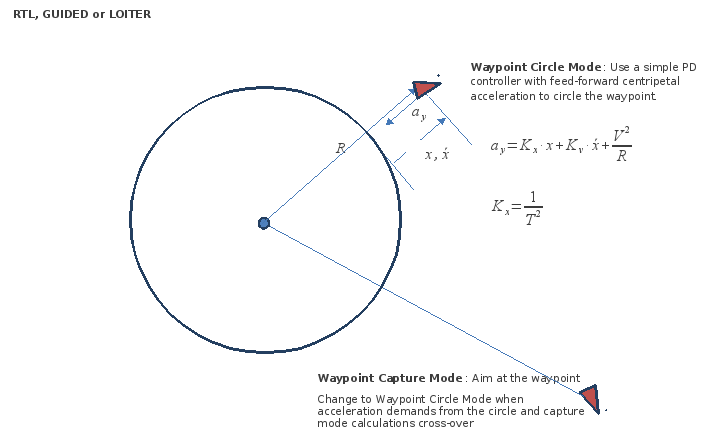 The waypoint circle tracking algorithm used during RTL, GUIDED and LOITER modes was modified to use a modified PD control law rather than the L1 control law. This was necessary to enable small loiter radius’ to be flown in combination with larger values of NAVL1_PERIOD. The distance from the next waypoint to start the turn onto the next track segment was modified to use the L1 length dynamically calculated by the algorithm, but constrained to be no greater than WP_RADIUS. This enabled the user to select whether they would rather fly through the waypoint and then turn, or turn early and smoothly intercept the next track.